Campers light up the forest as evening falls and the stars come out over Mt. 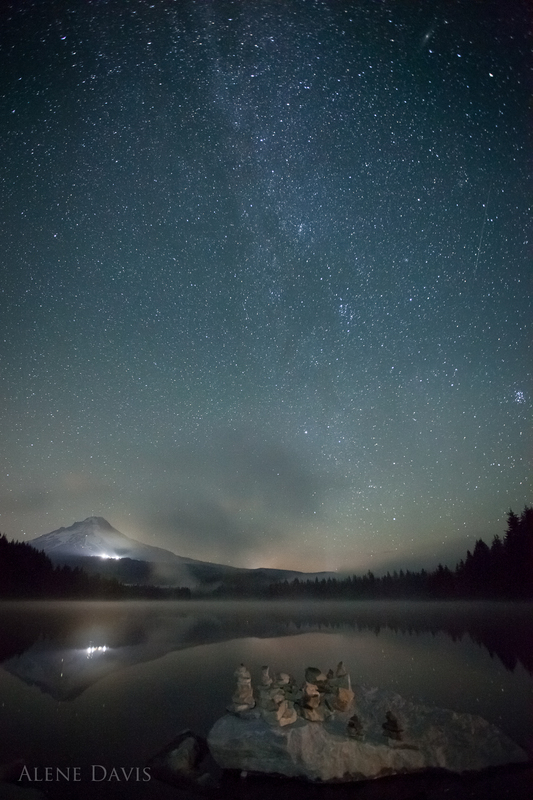 Hood at Trillium Lake, Oregon. Unlike some types of photography, where equipment isn’t a big deal, for night photography it’s important to have the right gear. Camera: A DSLR (digital single lens reflex) camera with a high ISO setting is important. Ideally you want a camera with an ISO of at least 6400, but higher is better. If your camera doesn’t have a high enough ISO, you may struggle with too much noise (colorful graininess) in your images. Tripod: A good sturdy tripod is essential to hold your camera steady during the long exposures required to photograph the stars at night. Intervalometer: While not essential, an intervalometer, which connects to your camera and lets you program exposure times and intervals, is very handy. To do good star trails (streaks of star movement as seen below) or a time lapse video, this is a must. Dim light source: To allow you to gently view your camera in the dark. Note, however, the memorizing your camera’s interface points and what they do is even better. Bright light source: To let you focus on objects at night, or for light painting. Extra batteries: Shooting the night sky can be battery intensive, particularly at night when it can get cold. Batteries don’t like the cold. They wimp out faster when they’re chilly. Extra cards: You’re going to have so much fun and get so excited about your time lapse video that you’ll wish you’d brought more memory cards to fill up before dawn. 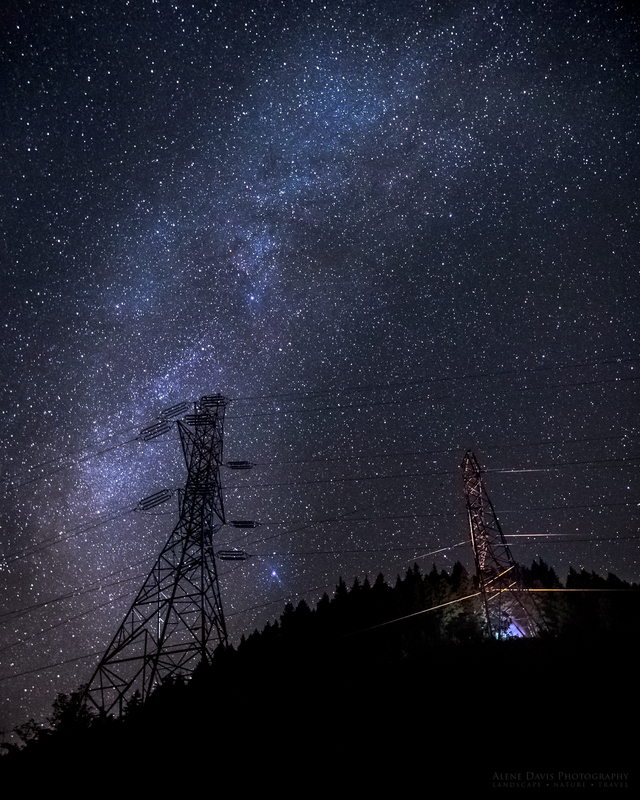 The Milky Way behind two transmission towers off Lolo Pass Road, Oregon. Star gazers unknowingly light painted the right-hand tower for me, to nice affect. If you shoot somewhere with other photographers in attendance, it’s important to know how not to ruin their shots. Turn of your car’s lights (headlights, door lights, dome lights). Don’t use your bright light source for any reason. You’ll just create light pollution that will affect the images of the other photographers. Be careful with your dim light. Don’t shine it in the direction of anyone else’s face (a dim light can ruin night vision), or at their camera or any objects in front of their lenses. A little light goes a long way during a long exposure, so be careful! Don’t walk in front of the line of their camera. Often times photographer shooting night skies use extreme wide angle lenses. These pick up a very wide spread of the world around the lens, so play it safe and stay completely behind other cameras, even if you aren’t close to them. Not sure how wide his composition is? Better to ask than be a blobby blurry silhouette in his otherwise awesome shot. I highly recommend arriving while it’s still light out. This will help tremendously with set-up up and composing and focusing your image. Look and walk around to find a composition you like. Consider having a landscape element in your image, as it adds visual interest to your photograph. Use your camera to test the composition. Set up your tripod and mount the camera. Make sure your tripod is on very solid ground. The long exposure times for your images mean you need rock-solid stability. Hook up your intervalometer and make sure your camera batteries are fresh and your card is empty. Give the lens glass a final cleaning. 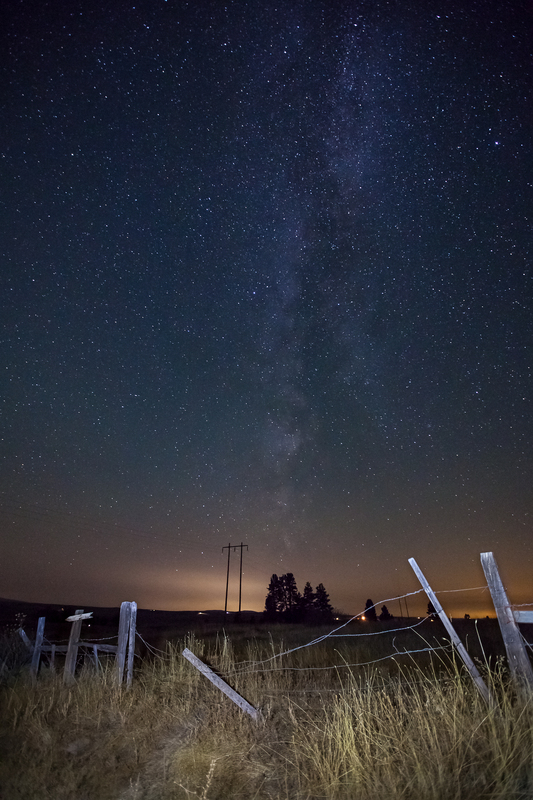 The milky way as seen while looking straight up into the night sky in rural Washington. White Balance: Daylight (and if you shoot in RAW you can always change it later). If you use Tungsten you’ll get a very blue sky and cyan stars, which can be a rather cool affect. Don’t use Auto White Balance if you are shooting a time lapse, as the camera may subtly modify the white balance from image to image. Shutter Speed: Whatever it needs to be to give you a correct exposure. Anything over 20 or 30 seconds will show star movement, meaning the stars will be little lines instead of dots. If you don’t mind longer exposure times that show some star movement, you can always lower your ISO to get less noise in your images. Determining your shutter speed can be a bit of a challenge and may require some trial and error if it’s too dark for your camera to assist you. Experiment and keep an eye on your histogram, which is a better predictor of proper exposure than the image on the back of the camera, but keep in mind you are shooting the black cavern of space with tiny balls of white-hot flame, so you’re not going to be seeing much in the middle of the histogram unless you are light painting. I typically start with 30 seconds and see where I’m at. If I’m under exposed I’ll need to raise my ISO or open my aperture, which will decrease my depth of field. I could go with a longer shutter speed (on Bulb setting), but this will give the stars some movement. If the image is too bright, I might try 15 seconds for the next attempt, and adjust from there. A rock cairn on the shore of Trillium Lake, with fog across the lake. This required decent depth of field to have the rocks, the mountain and the sky in focus. This is also an example of “light painting” on the rocks. Focusing: When it comes to focusing at night, I offer the following advice: focus before it gets dark! “But,” you say, “it’s boooooooring to wait around from when it’s light out until it’s truly dark. I’m going to be having a beer with my friends until midnight, then go shoot the stars.” Or perhaps you want to do multiple compositions after dark and need to move your camera around and refocus. Very well, my friend, read on. Normally we focus by either setting the camera to auto-focus, or we manually focus by looking through the viewfinder or live preview. Often in night photography, however, neither we nor the camera can readily see anything recognizable in all that darkness to focus on. How do we make sure the image is in focus, then? Great question! I offer you two methods here. Feel free to comment if you have other techniques. Option 1: Set the lens to manual focusing, then use a high-intensity flashlight to light up something in your image, and focus on it through the viewfinder. Be careful that you have enough depth of field to have both your foreground/middle-ground object AND the stars in focus (see Aperture in the Camera Settings section). This technique only works if your image has something in it close enough to shine a light on. NOTE: This is not the best way to focus if you are with a group of photographers and someone else has your focusing object in their composition. By shining your light on that object you will be “light painting” (see more on that below) that object for them. This is a great way to piss off your fellow photographers if that isn’t an affect they were after. This can be especially annoying for someone shooting a time lapse (see more on that below), as you will essentially ruin that frame(s) in their video. Option 2: Set the lens to manual focusing, then guestimate your focus by looking at the top of your lens at the window that shows your approximate focal point distance. Take the photo, then hit the “play” button on the back of your camera, zoom in, and see if you got the focus right. Tweak and double-check until you nail it. You will notice that “infinity” typically has quite a bit of movement in its range, so don’t assume that anywhere in the infinity zone will work. Option 2 is the preferred method when focusing with other photographers around, to avoid light pollution. Star Images: If you want single images, it doesn’t matter what the interval is between them. This is your best desired outcome if you don’t have an intervalometer. The stars over Mt. Hood and Trillium Lake. Star Trails: These are done by taking multiple images, one immediately after the other, generally over a period of time lasting at least 15 minutes. Then open the resulting images as layers in Adobe Photoshop and set the layer properties to “Lighten”. This will result in the trail of each star showing as a streak. 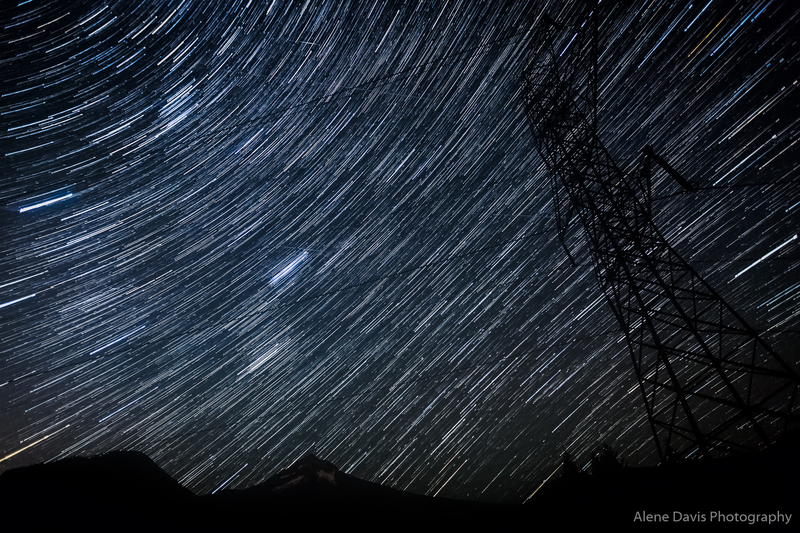 Star Trails with the silhouette of a transmission tower and Mt. Hood in the background, off Lolo Pass Road, Oregon. Time lapse videos are very time intensive, but the results are amazing. Each image will be a single frame and your video will likely be at around 30 frames per second. So if each exposure is 30 seconds long, that’s 1 second of video for every 15 minutes of continuous shooting! Be sure to set your camera to manual to avoid variations in exposure. Leave a comment to let me know if you want me to post a blog outlining how to process a time lapse once you’ve captured your images. 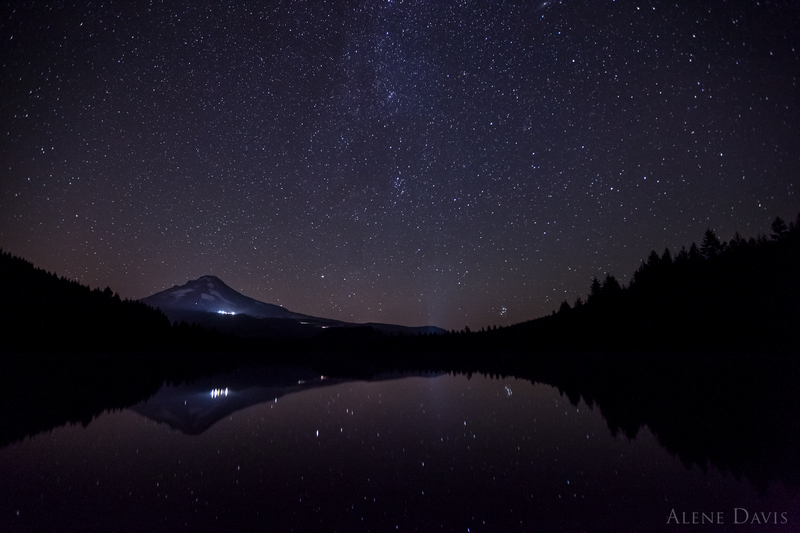 For an example of a starry sky time lapse (shot by moi) click here. Start the intervalometer. Unless you are worried about condensation or bugs on your lens, you don’t need to babysit your camera. Once you trigger the intervalometer to capture repeated images, this is a good time to stretch your legs and warm up your fingers and toes. Meteors: Best attempted during a known meteor shower. Use an intervalometer to take photo after photo after photo, at a minimum interval between each. Try to use a fast enough shutter speed that a meteor, which will often last less than a second, still registers as a bright streak in your exposure. So, no more than 15 seconds in my experience, and less is better. 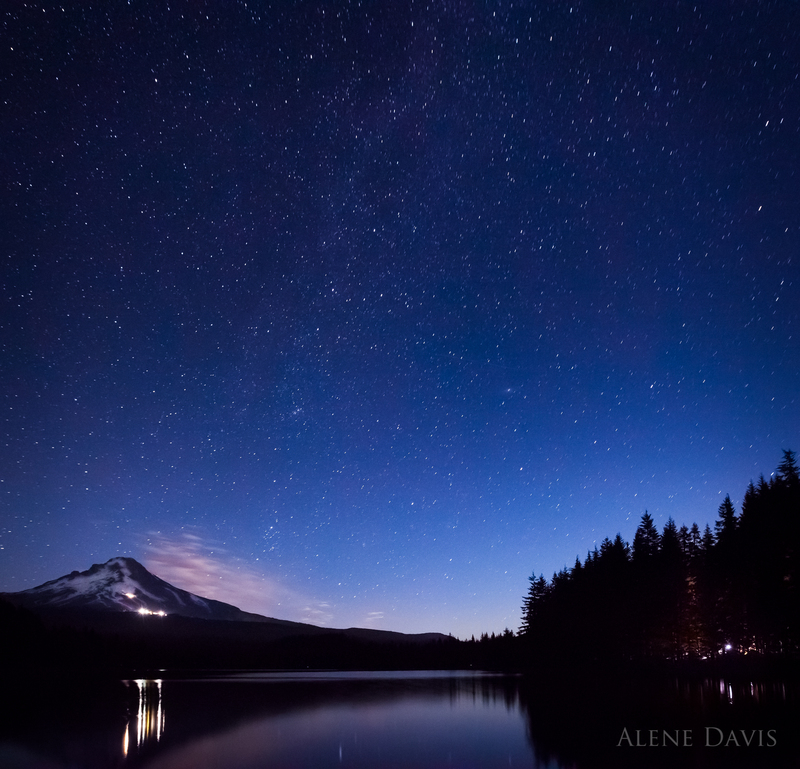 A meteor in the sky over a foggy Trillium Lake, with Mt. Hood and Timberline Lodge glowing in the background. If you get what looks like a meteor in one image, then another one in the next image, and another one again in the following, and they are all lined up, congratulations! You’ve captured a satellite! If your satellite left a trail of (often green or red) dots, congratulations! You’ve captured an airplane! Light Painting: Use your light source to light up the foreground and/or middle ground of your image. This requires experimentation to get the right amount of light on the objects. typically you will light paint for only part of the overall exposure time, due to the intensity of the light source. Go gently. A little light goes a long way. 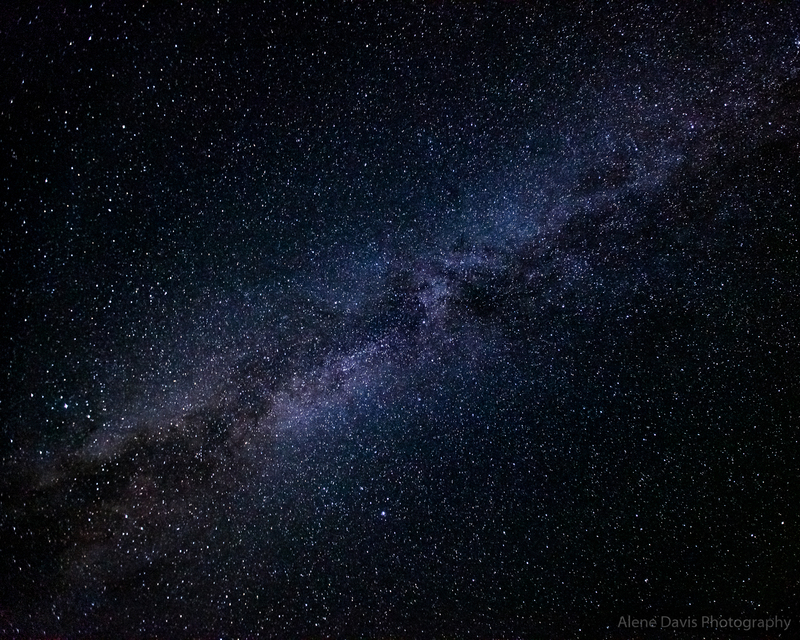 The Milky Way as seen from central Washington. The foreground was lit by “light painting” using a camping head lamp. Condensation: On my most recent trip I ran into an issue with condensation on my camera and lens. The water itself wasn’t an issue since I have a high quality camera build, but it did heavily fog my lens. Normally, you can avoid this by letting your camera adjust to the temperature of the outside air before you set it up. But in this case the ambient temperature was dropping rapidly and we were hitting the dew point. Everything was collecting dew, including my lens! Unfortunately it was so dark I didn’t notice. My husband and I were huddled under a blanket on lounge chairs looking up at the sky and watching for meteors (gotta love that intervalometer!). By the time I noticed how damp everything was and thought to check my lens hundreds of shots had been taken through a foggy lens. So much for my lovely time lapse! The only solution I know of for this particular problem is to blow warm dry air across the lens to keep it dry. As in taking a portable hair drier with you! That or wipe the lens before every shot. If, however, it’s a matter of introducing a cold camera to a warm humid environment (for example you have the AC on in your car then stop to photograph on a warm humid summer night), the solution is to let your camera acclimate to the ambient temperature while in a sealed plastic bag, then introduce it to the outside air. Yay! You did it and those shots looked awesome on the back of your camera! You get them back and upload them and open one of those babies up full-size on your big monitor and. . . oh. It’s noisy and grainy and. . . well, not like those hi-res NASA images of a nebula at all! Yup. That’s the deal with night sky photography. You and I can’t afford the hubble telescope. So what can we do? If you have Adobe Lightroom, great! I’m going to go over some recommendations for how to post process your sky images to make them read better in a future blog, but for now, let me offer this: start by reducing the noise and playing with the black point setting. 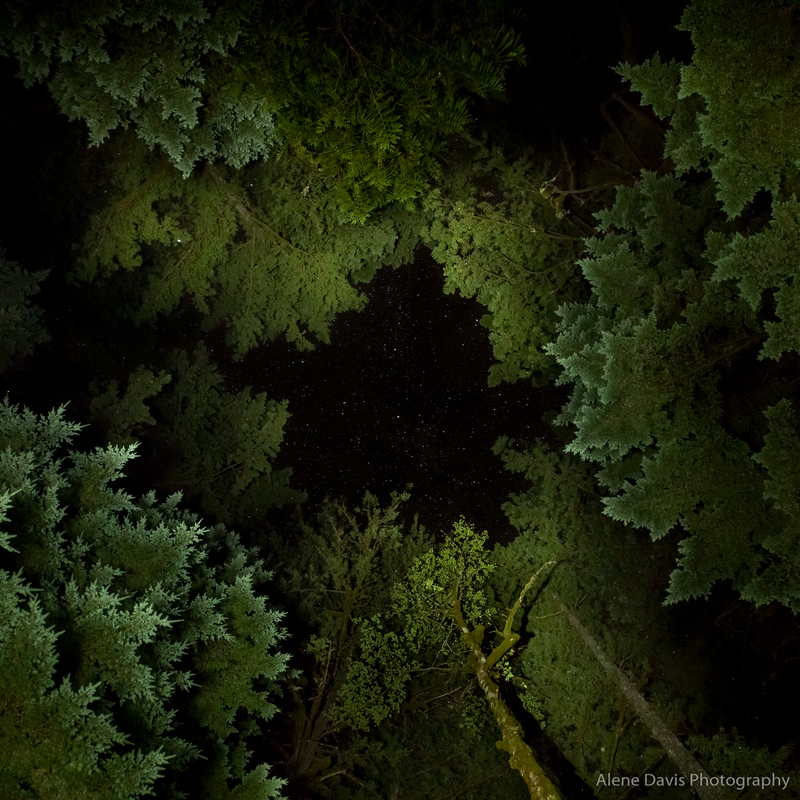 Stars in a break in the trees in the Mt. Hood National Forest. An example of light painting. 6 responses to Shooting Stars! It’s easy to forget about all the apps we have! Sometimes I just browse them to remind myself. LOL! Holy moly, Alene, those are gorgeous, awe inspiring shots! Thank you for the post, I’ve always wondered at the nuts and bolts of taking night shots, this blog post is a great resource! So I reread this last night in advance of embarking on my trip to shoot the lights in Alaska and I was just as riveted on the second reading. Thanks for the great tips, Alene. I’ll be trying them out this week and look forward to sharing the results with you and learning how to improve them in the lightroom. Keep at it! Next post Hello Big Beautiful World!